we know it was a bit quiet the last year. There was a lot going on at the Klonk Headquarters. First of all: We found a great new partner for our studio: Daedalic Entertainment. We got together in March and founded the brand new studio Daedalic Entertainment Bavaria. Our new partnership is really great and gives us a lot more opportunities than we had before. And because of that we can make a special announcement today. Yes, it is finally happening! 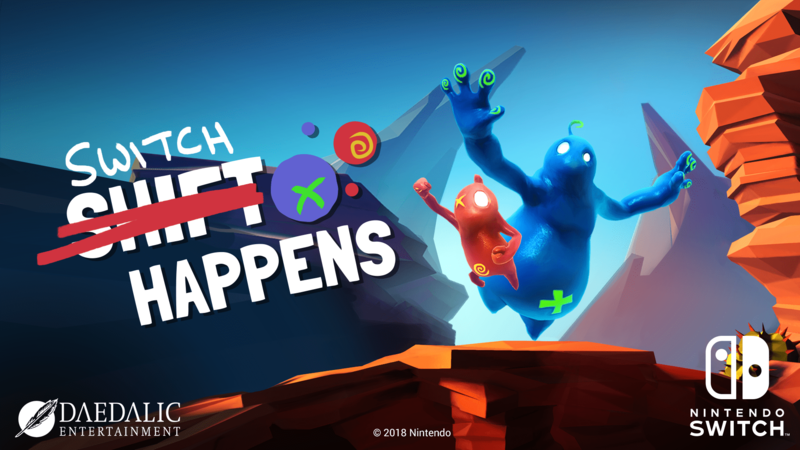 Shift Happens will come to Nintendo Switch on October 10th this year, so only two weeks from now. Here’s the the full press release. With the Nintendo Switch you are no longer bound to your own couch and can enjoy Shift Happens where ever you want. You can get the digital version of the game on October 10th at the Nintendo eShop for $14.99. The development of the game was a fun ride and we are really happy to be able to bring it to all the platforms we wanted. The Nintendo Switch is a bit special to us because most of the team grew up with Nintendos amazing consoles which accompanied us during the years of our childhood. To be able to bring one of our own games to this platform makes us really proud and we hope you will have a lot of fun with it! This entry was posted in News, Update. Bookmark the permalink.